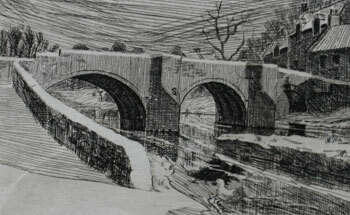 An Etching signed Alexander Cameron, of Canongate Bridge in Jedburgh, Scottish Borders. The paper exhibits the classic effects of the wood-pulp backing card leaching out stains due to condensation. Restored for a client in Kelso.